President Donald Trump announced to reporters at the White House that the Islamic State in Syria would be "gone by tonight." He made the announcement with some fanfare, unfurling a big piece of paper that he had carried out with him to Marine One. He then guided the press through two maps of Syria and Iraq showing the progress of the Islamic State's defeat. "I brought this out for you -- this is a map of everything in the red, this was on election night, in 2016, everything red is ISIS. When I took it over it was a mess now on the bottom it's the exact same. There is no red," Trump said, pointing his finger at the different parts of the map. "In fact there is a tiny spot which will be gone by tonight," Trump said. It was the third time in recent months that the president announced victory -- or near victory -- over the Islamic State. In February, the president said ISIS would be 100 percent defeated "very soon," and in December he declared "we have won against ISIS." Currently, only a small holdout of ISIS territory remains in eastern Syria, but there are no indications the Syrian Democratic Forces plan to declare the region is liberated of the terrorist group. Trump appeared eager to share the news with reporters gathered on the South Lawn to pepper the president with questions before he left to tour a factory in Lima, Ohio. The president emerged from the Oval Office and had previously received his intelligence briefing. "This just came out 20 minutes ago," Trump said of the map. 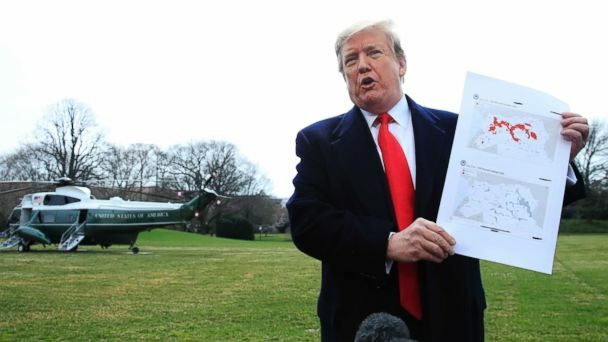 The timing raised questions about whether the president -- who is known to appreciate colored maps and charts in his intelligence briefings -- took the map to journalists shortly after a classified meeting with top officials. The White House did not directly respond to a question about the origins of the map. "The map highlighted the fact that over the last two years, under President Trump's leadership, the United States and our Coalition partners have liberated more than 20,000 square miles of territory previously held by ISIS in Syria," a White House spokesperson said. Later in Ohio, the president was again eager to share his colored map with an audience. "Where is that chart? They gave me economic trends and not the ISIS chart. Bring up, if anyone has it," Trump said, calling out for an aide to deliver him the maps. In December, the president announced unexpectedly that he planned to withdraw all remaining U.S. forces from Syria. The decision caught the U.S. military off guard and even prompted the resignation of then-Secretary of Defense James Mattis. Since then, 400 American fighters remain in different parts of the region. The Associated Press reported on Tuesday that U.S.-backed Syrian fighters had seized control of an encampment held by ISIS, a signal that forces were closing in. ABC News' Elizabeth McLaughlin contributed to this report from the Pentagon.